Here's two fuzzy pictures of one of many nightmares I found in a building our company bought a short while ago. I discovered the problem when I plugged a drill into this outlet and the drill quietly hummed as the exit light went out. This is a 277V exit sign. The electrical outlet is being powered by the tiny 277/120 transformer that normally powers the two 15W lightbulbs. socket-outlet or a PIR sensor? The bogus 120V receptace may be feeding a plugged-in ~5VA wall wart and—irresponislbe as it is—may actually sort of work. Any idea what the capacity of the transformer is? Judging from its physical size, it doesn't look to be much larger than required to simply power the two lamps (the original intent, of course). It also appears that the lamps are burned out or have a lot of hours on them. One more question; is the 277v. entry in the back center of the fixture? If so, it looks kinda like NM cable. From an old codebook (I have a new one coming); Art. 700-13 - "No appliances and no lamps, other than those specified as required for emergency use, shall be supplied by emergency lighting circuits." The little transformer looks like maybe a 3-lead autotransformer—bet 15VA max. The rear-entry cable could be NM—with bare ground wire and possibly showing brown-paper fill. The cable is NM with no clamp at the back of the exit sign. And this is a nursing home, I believe NM is only suitable in sleeping areas there anyway. This is the front lobby. The outlet powers that little plug in transformer for a door alarm and apparently it worked that way for years. I have no idea how big the transformer is, no marking on it at all. But they had the foresight of future-proofing—a spare outlet for the swill-mart carbon-monoxide detector when they go on sale in February. 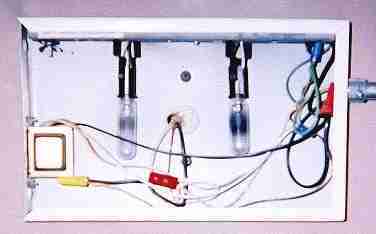 [Might have to wait ‘til one of the exit-sign lamps burns out to avoid overloading the 277-120V transformer.] They reached the sign with four stacked chairs from the piano room, and got materials by mail from the Sears and Roebuck catalog—summer 1955 farm & garden edition.